Calicut University Degree First Allotment 2018 on 13-6-2018 Calicut University UGCAP First Allotment Result 2018 to be published on June 13th, 2018 at the official web site of university of calicut www.ugcap.uoc.ac.in. The University degree admission and allotment process made through the centralised allotment process CAP. The Candidates who have registered for admission to A/BCom/BSc and other degree courses through calicut university UGCAP 2018 can check their degree allotment status on university website www.cuonline.ac.in by using CAP id and Password. 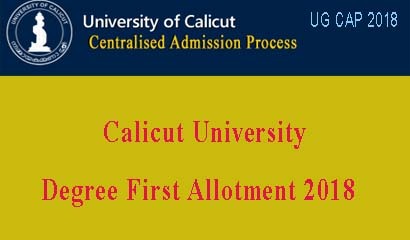 Calicut University Degree First Allotment 2018 is the actual allotment list of the candidates who will be getting sure admission based on their options selected in the CAP application form. The allotted candidates should remit the mandatory fee within 13.06.2018 to 16.06.2018 to confirm their allotment. If failed to make payment within this time , the allotment will be canceled. The candidates who get allotment should report to the college with receipt/chalan of the fee remitted to join the programme within the scheduled date. The Calicut University 1st allotment result 2018 can be checked by login to the web site www.cuonline.ac.in with the capid and password. CAPID is the unique id that was generated by the CAP system during the time of online application registration. The calicut university has already published the trial allotment and after the trial allotment result, the candidates got a chance to modify the option registration. Based on the options registered by the candidates, the university has prepared the UGCAP First allotment list for admission to UG degree courses under the calicut university for the academic year 2018-19. This degree first allotment result will be published on official web site only. There will be three main allotments and two special allotments are conducted by the university for the degree admission. The candidates who got an allotment in the calicut degree first allotment 2018 should have to pay the mandatory fee within the time for confirmation of the allotment. Then after the candidate must have to login to the web site and deemed to have accepted the admission to the course and college allotted. Those who fail to remit the fee or those who fail accept allotment on or before the time prescribed for the same will lose the current allotment as well as the eligibility for further allotments. The candidates who receive allotment should pay the following mandatory fee within the prescribed time, for confirmation of the allotment. For SC/ST : A refundable fee of Rs 105/- only need be remitted. (1) Pay the mandatory fee (E-chalan/online payment ) within the specified time to confirmation the current allotment. ii. College copy of the E-chalan/online payment slip for registration fee. iii. Receipt/Chalan of the fee remitted for acceptance of allotment. (University mandatory). iv. Age proof , Qualifying Certificate and Mark List(s) of the qualifying examination. v. Transfer Certificate received from the Institution last studied. vii. Those candidates who have passed examinations other than HSE/VHSE except CBSE/CISCE should produce Equivalency/Recognition Certificate from University of Calicut. ix. Candidates who claim bonus/weight age marks shall produce relevant certificates.